Summer is the Outer Banks’ most popular season, but there are great reasons to visit all year. Spring – April brings a warmer average 69 degree temperature. Shops, restaurants and activity companies begin opening. Vacation rental homes are still a bargain, with lower rates until late May. The ocean remains brisk at around 60 degrees. Bird watching and fishing are popular activities in the early Spring. Summer – The most popular time of year. Book your accommodations early! As school lets out, families fill the Outer Banks for Summer vacation. Most vacation rental homes rent weekly and turn over on weekends. The area is abuzz with activity. All restaurants, shops and activities are running full schedules. The #1 attraction is the beach, but it doesn’t crowd like dense hotel-heavy resort areas. Average high temperatures hover in the mid 80’s. The ocean feels refreshing, but not cold in the upper 70’s. Fall – September and October are fantastic in the Outer Banks. Most shops and restaurants are open. Temperatures hover in the mid 70’s. Vacation rental homes and hotel pricing drops. Nothing is crowded. This is a popular time for wind surfers and kiteboarders, as well as nature enthusiasts and visitors seeking a relaxing retreat. Winter – Winter is perfect for those wanting relaxation, seclusion and quiet. Core amenities like grocery stores remain open. The central towns of Kitty Hawk, Kill Devil Hills and Nags Head offer the best opportunities for dining, shopping and entertainment. Carova, Corolla, Duck, Hatteras and Ocracoke Islands offer the most solitude. Hotel and rental home rates are generally the least expensive. Expect high temperatures in the mid 50’s. Part of the charm of the Outer Banks is the unique experience each town offers. Here is our quick take on each town, starting in the North. 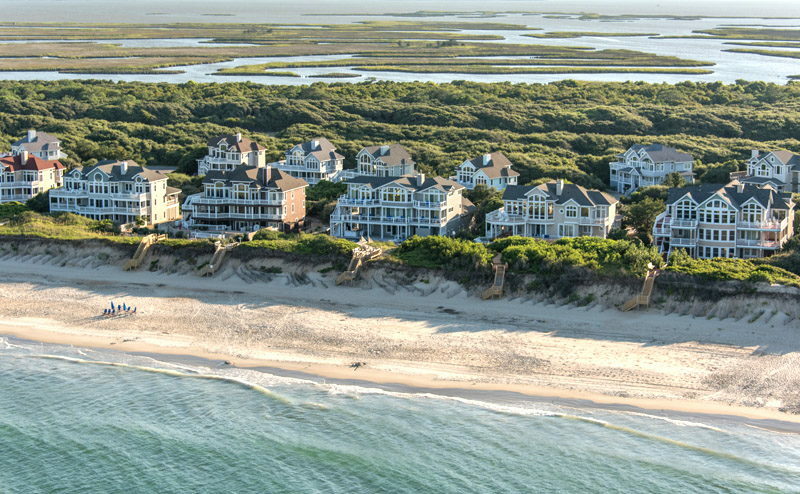 Virtually every town offers waterfront rental homes and access. Select the town name to see our in-depth article. Vacation Rentals - We have a list of the best vacation rental companies here. 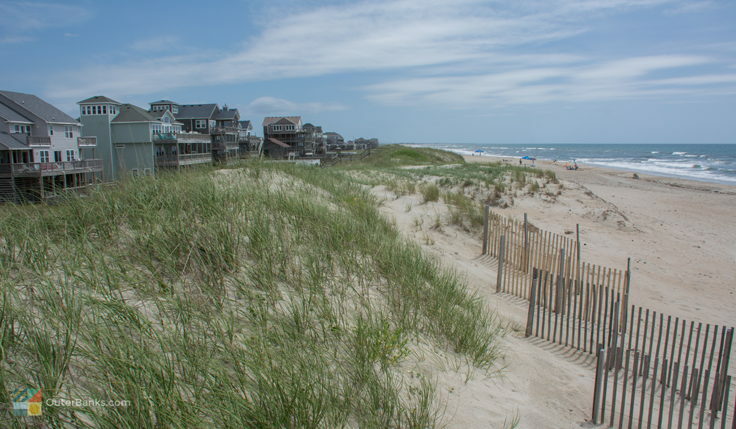 There are several thousand vacation rental homes in the Outer Banks. In fact, vacation rental homes are the most popular accommodation. We have indexed thousands of rental homes that you can’t find on any of the national search sites. Hotels – The Outer Banks also has several hotels (many oceanfront) from Corolla to Ocracoke. Check out our list here. Campgrounds – Camping opportunities exist on Hatteras Island in the tri-villages, Frisco, and Buxton, and on Ocracoke Island. Carova – This 4x4-only access neighborhood is technically part of Corolla. That’s right, you’ll have to drive on the beach to reach your rental home. In addition to the novelty of 4x4-only access, Carova is best known for the herd of wild Spanish Mustangs that roam freely along the beach, maritime forest and rental homes. Visitors will need to travel south to Corolla for restaurants, shopping and supplies. Carova provides luxury rental homes in a beautiful natural setting. Depending on the location of your rental home, Corolla is a 10-30 minutes drive South. Corolla – Picturesque Corolla is known for its large, luxurious rental homes and beautiful surroundings. Corolla beaches don’t feel crowded, even in the middle of Summer. Upscale amenities include a large grocery store, a couple boutique hotels, several restaurants and multiple boutique shopping centers. Popular spots include the beach, Currituck Beach Lighthouse, The Club at Whalehead and sunsets at Historic Corolla Park. Carova is a short 10 minute drive North, and Duck is a 15 minute drive South. Duck – Duck is known for its beautiful vacation homes, resorts, local eateries and boutique shopping. Duck is great for families that want a beautiful setting and quick access to activities, shopping and restaurants. Duck has a small village feel with one main road through the center of town. Popular spots include the waterfront shops and Duck Town Park with an extensive boardwalk over the Currituck Sound. From Duck, Corolla is about 15 minutes North and Kitty Hawk is about 15 minutes drive South. Southern Shores – Southern Shores is a small area just North of Kitty Hawk. Southern Shores offers vacation rental homes and one small shopping center. Visitors staying in Southern Shores like the quick access to Kitty Hawk amenities and close proximity to Duck & Corolla villages. Kitty Hawk is a 5-10 minute drive South and Duck is a 10-15 minute drive North. Kitty Hawk – The Northernmost “central Outer Banks” town, Kitty Hawk offers lots of quick access to the beach and amenities. There are many year-round shopping and dining opportunities nearby. Accommodations include a vast selection of vacation rental homes and resort oceanfront hotels. Visitors to Kitty Hawk have lots of options and quick access to everything they need. Kitty Hawk runs from milepost 1.5 to milepost 5. Kill Devil Hills – Much like Kitty Hawk, Kill Devil Hills is a centrally-located year-round town. Visitors have fast access to the Outer Banks best variety of restaurants, shopping and activities and amusements. Rental homes and hotels are both popular ways to stay. Kill Devil Hills is famous for the Wright Brothers National Memorial and the site of the iconic first flight. Kill Devil Hills runs from milepost 5 to milepost 10. 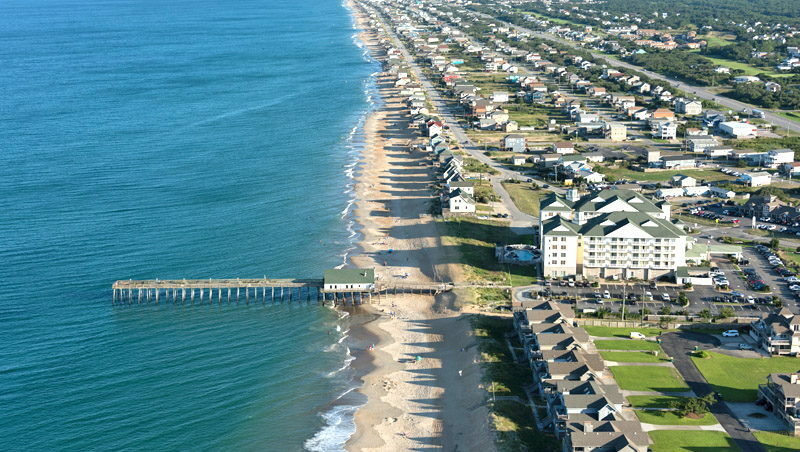 Nags Head – Nags head arguably has the most “city-like” feel of the Outer Banks. In addition to lots of restaurants and shopping opportunities, there are plenty of oceanfront rental homes, hotels, fishing piers, amusements, activities and tours available nearby. The Outer Banks hospital is located here. Popular attractions include Jennette’s Pier, Jockey’s Ridge State Park and Bodie Island Lighthouse. Manteo – Just a 10 minute drive from Nags Head, Manteo on Roanoke Island is full of charm and activities. Accommodations in this historic village include Bed and Breakfasts, hotels and rental homes. Downtown Manteo offers local dining, boutique shopping and a small marina. Manteo is a small village with several of the Outer Banks best attractions. Each year, visitors flock to downtown Manteo, Roanoke Marshes Lighthouse, Festival Island Park, Elizabethan Gardens and the NC Aquarium. Wherever you stay in the Outer Banks, you should plan a day trip to see Manteo’s attractions. Rodanthe, Waves & Salvo – The Northernmost towns on Hatteras Island are the tri-villages of Rodanthe, Waves and Salvo. 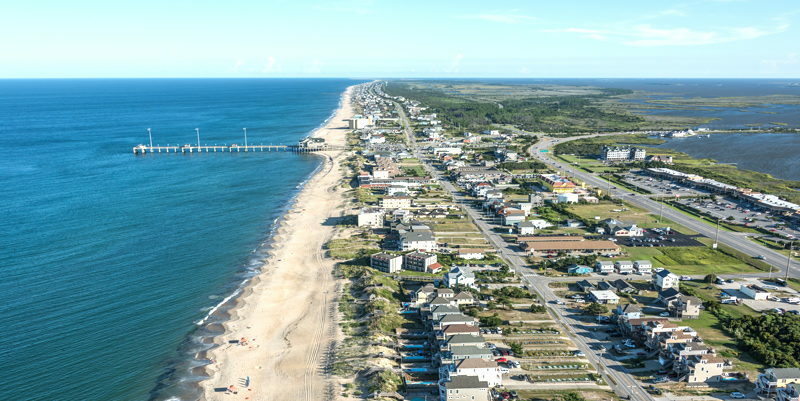 Spanning just 4.5 miles of NC-12, the tri-villages are a legendary hub for windsurfers and kiteboarders. There are a couple of restaurants here, and two large-scale water sports activity centers (Real Watersports and Kitty Hawk Kites). Popular accommodations include rental homes and RV/camping. There are more amenities 15 minutes South in Avon, or 30 minutes North in Nags Head. Avon – Avon is a small village centrally located on Hatteras Island. Avon has the island’s only major grocery store and a shopping center. Rental homes are the most popular accommodations in Avon. Buxton – Buxton is a small village about 15 minutes South of Avon. It is home to some small restaurants and shops, a couple hotels, small grocery store, a campground and and dozens of rental homes. The most famous attraction in Buxton is the Cape Hatteras Lighthouse and nearby Cape Point. There are great 4x4 beach access points (permit required to drive on the beach) and surf fishing is very popular all year. Frisco – Frisco is a small village with a couple of local restaurants and a small airport. Visitors wanting to stay in Frisco should search for a rental home. Hatteras Village – The Southernmost town on Hatteras Island, Hatteras Village is home to some larger rental homes, several marinas, restaurants and Hatteras Landing shopping center. There is a ferry terminal to Swan Quarter NC and Ocracoke Island. Graveyard of the Atlantic museum also sits at the Southern end of Hatteras Village. Ocracoke – Adventure across the water on the complimentary NCDOT ferry from Hatteras Village to Ocracoke Island. At the southern end of Ocracoke Island is Ocracoke Village. This small village surrounds a harbor with sailboats, ferries and fishing boats. Vacation rental homes, B&B’s and hotels are available, as well as a handful of lively restaurants. Ocracoke is a great place to really get away from it all. The Outer Banks offers activities for everyone. Here is a brief list of some of our favorites. The Beach – Obviously, the beach is the #1 attraction for Outer Banks visitors. Check out our Beaches Guide, Driving on the beach guide, and beach regulations guide. Events – The Outer Banks is home to several music festivals, running events, water sports competitions, fishing tournaments, foodie festivals and parades. Check out our events calendar. Amusements – Spend the day at a water park. Try a great miniature golf course. Play video games and sports. Try a rope course. Go karting. Rent a boat – Several companies in Duck, Corolla and Nags Head rent boats. Tour around the sound and enjoy the Outer Banks from a new perspective. Educational Activities – Learn to surf, wind surf, kiteboard, sail, paddleboard, kayak or ride a horse. Take a tour to see the wild Spanish mustangs of Carova. See dolphins in their natural habitat. Visit the NC aquarium to learn about local aquatic life. Tours – Have a local expert show you around. See wild horses or dolphins. Kayak to a wildlife refuge. Ride a horse along the beach. Parasail above the Currituck Sound. Try a deep sea fishing charter. Parks – Climb a lighthouse, visit the Outer Banks Center for Wildlife Education and see the sunset at Historic Corolla Park. Spend an afternoon climbing dunes or hang gliding at Jockey’s Ridge State Park in Nags Head. Tour the beautiful Elizabethan Gardens in Manteo. Visit the grounds of the Wright Brother’s National Memorial. Walk along the Currituck sound on the famous Duck Town Park boardwalk. Fishing piers – Take a walk out over the ocean from one of the Outer Banks fishing piers. Try your luck with some pier fishing. Lighthouses – Climb one of the Outer Banks’ famous lighthouses. Currituck Beach Lighthouse, Bodie Island Lighthouse and Cape Hatteras Lighthouse all offer seasonal self-guided climbing tours. Spend time in nature – We recommend the Elizabeth Gardens, Jockey’s Ridge State Park, Pea Island Wildlife Refuge, and the boardwalk at the Currituck Banks Coastal Estuarine Reserve in Corolla. Learn the local history – Great spots include the Wright Brother’s National Memorial, Outer Banks History Center, Roanoke Island Festival Park, Fort Raleigh, Chicamacomico Lifesaving Station, Frisco Native American Museum, one of the local lighthouses, the Club at Whalehead and the Graveyard of the Atlantic Museum in Hatteras Village. Golf - Check out our feature on the North East NC Golf Trail. Shop – The Outer Banks is home to hundreds of charming, boutique shops. Find that special item you can’t find anywhere else. Highlights include Timbuck II in Corolla, the Waterfront Shops in Duck, and Tanger Outlet Mall in Nags Head. Dine out – Two words: Local. Seafood. It doesn’t get any fresher. And don’t miss the local NC produce. Or have it delivered to your rental home. You’re sure to have an unforgettable meal. For your rental home – Some rental homes include linens. Others do not. Check to see whether you’ll need to bring your own bedding and towels. As for general supplies, we recommend packing (or buying locally upon arrival) soap, toilet paper, paper towels, food, snacks and condiments to get started. We also recommend a laptop or tablet so you can keep coming back to OuterBanks.com for more great ideas. 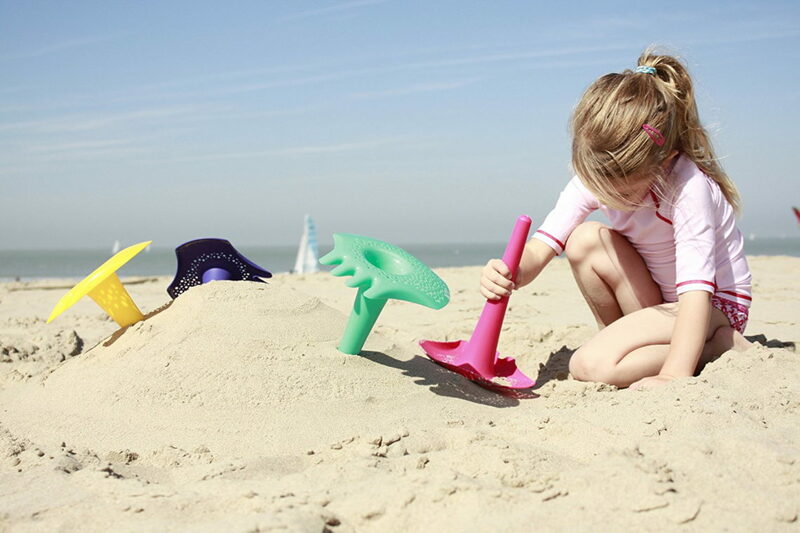 For the Beach – Check out our list of favorite beach umbrellas, carts and favorite beach games. If you are going to drive on the beaches, check out our 4x4 driving on the beach guide. For everybody – Don’t forget to pack sunscreen, sunglasses, a camera and your sense of adventure! Also, don’t forget to check out our coupons page. Print or bookmark several offers and save money during your visit. $10 Card for Only $5! Get a $10 WineStation Card for Half Price! FREE 18 HOLES! Play Before 5 p.m.